I don't ordinarily post about these sorts of subjects, but as an avid lifestyle magazine reader I notice trends and recurring themes in the design, imagery and subject matter of these publications. I just don't often talk about them. 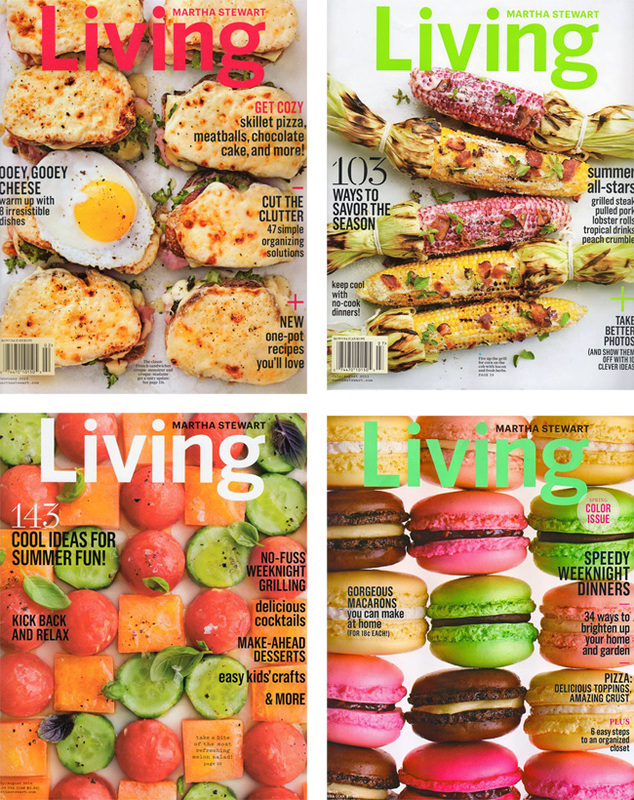 What follows is a completely non-academic post about a growing trend I've noticed in food magazines, specifically the imagery and fonts used on their covers. 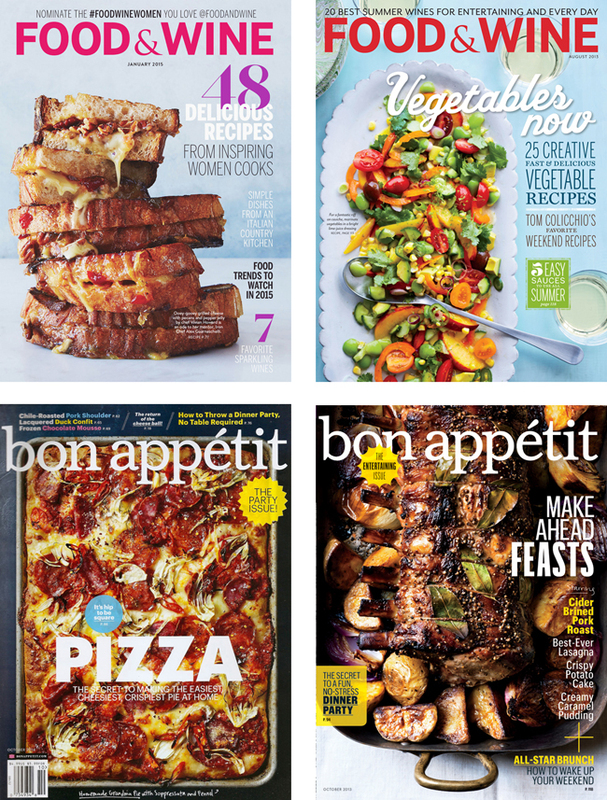 I'm sure I am not alone in my observation that the imagery used on the covers of popular food magazines today is becoming increasingly 'messy' or 'unruly' - to use a more euphemistic term. Gone are the days of the artfully plated meal or the iconic, singular image of a beautiful cake on a pedestal. Instead, there are stacks, piles, rows, pyramids and heaps of food on many of the covers of the world's most popular food magazines, casually arranged to appear rustic and hastily prepared - an intended reflection, perhaps, of our hurried schedules, designed to be reassuring to the busy cook or hostess who abhors fast food but can't seem to escape the allure of its convenience. I understand the point, believe me. The editors and art directors are aiming to make the food appear 'real' and appetizing, to give the home cook the confidence to say, "Hey, I made it look exactly like it looks on the cover! I'll buy this magazine again!" That's very nice, but sloppy joes or a plate full of heaping mounds of mac and cheese do not make a pretty cover. Without overstating it, I feel this approach devalues the art of good food styling, thoughtful photography and innovative image making, essentially underestimating the readers' abilities, curiosity levels and intelligence. I suppose, in a way, I find these covers to be patronizing. 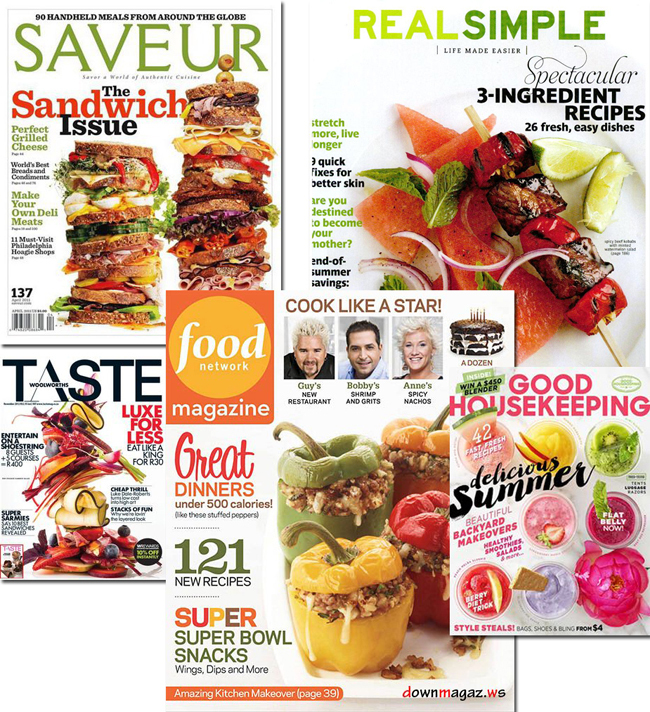 Below are some images I've selected of popular food magazines - Martha's included - that have fallen victim to this trend. I say 'victim' because after several years in practice this trend has become cannibalistic. The image of food tossed 'rustically' onto a platter or cheese board is no longer innovative or eye-catching or even pleasant to look at. It is visually polluting the newsstands with too many stacked sandwiches, rows of cookies, pyramids of corn and slabs of grilled meat. 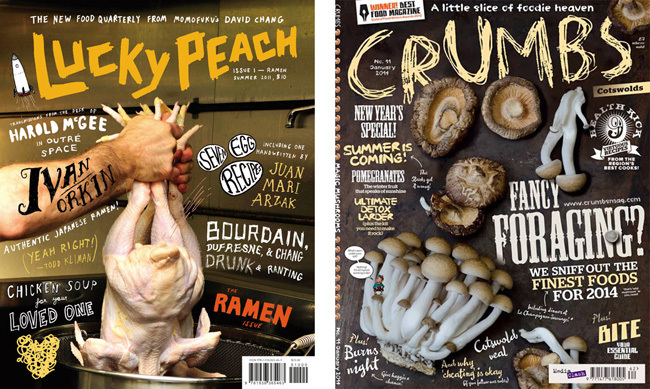 Each of the food magazine covers below illustrate, I think, the overuse and saturation of this kind of imagery in the food-publishing industry. Frankly, I think it is time for it to go away. I find it confusing to the eye, cluttered, almost anti-design. And I don't like it - especially not on Martha's covers, which used to be so perfectly styled and beautifully rendered to appear effortlessly elegant. Perhaps you will agree with me, or perhaps you will take a different view. Please leave a comment and share your thoughts! A cross-section of the food magazines on offer at the newsstand illustrates my point. The copycat imagery renders any sort of brand identity moot because it is replicated ad nauseum across multiple publications. The visual cues are all the same: white background, food that appears intentionally casual and rustic with melting cheese and squishy mayonnaise, stacked, grouped, lined into rows or hastily tossed onto a platter. Food & Wine and Bon Appetit are two of the biggest abusers of this trend. I'm sure the food depicted in these images is delicious, it just looks messy and cluttered from a design standpoint. Over the last two years, some of Martha's magazine covers have fallen into the trap as well, as shown above. I wrote about this earlier in my annual review of Martha Stewart Living magazine. The editors have not resorted to using grotesque and garish fonts that scream desperately for attention, thank goodness. However, it is disappointing that they felt the need to follow the trend in the first place: "white background, food that appears intentionally casual and rustic with melting cheese and squishy mayonnaise, stacked, grouped, lined into rows or hastily tossed onto a platter." Of the images shown above, these covers are the most restrained but I am still not a big fan of them. It is the ubiquity of this sort of styling that I am taking aim at, not the imagery itself. These photographs, while perfectly fine on their own, do not deserve cover status. The masthead and subheadings become lost in the visual clutter, rendering them almost useless. 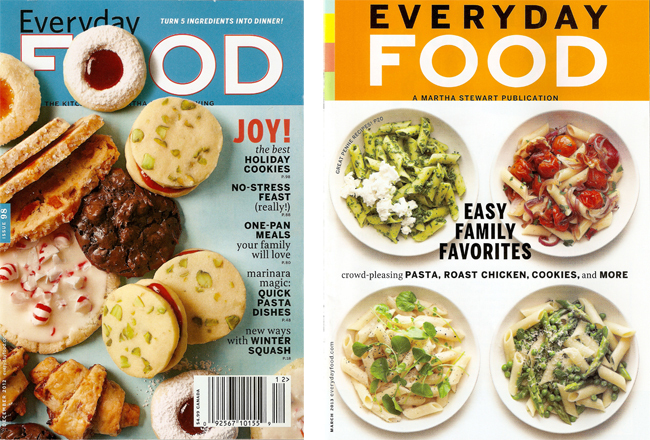 Everyday Food was guilty of the trend as well, although I am more forgiving of this little magazine because on smaller covers the imagery works better somehow. It is less invasive; it's more contained and therefore more palatable. After a while, it all starts to look the same and ideas get repeated and regurgitated and then forgotten, and then resurrected and recycled again, by everyone in publishing - and that's not fair to the reader. For the readers - a group I will always vehemently defend, because, well, I am one - it is nullifying to the curious and beauty-seeking eye. Perhaps there is no solution to this. Perhaps magazines are doomed to copy each other and outdo each other by basically cannibalizing each other and morphing into replicas of the competition. I have no advice for these publications, to be honest, because I understand they are all essentially in business to make a profit and will adopt trends, copy competitors that sell more copies and hope that they too will see a profit in return. But identity is lost. Brand recognition is lost. It truly is in the best interest of these publications to own their unique identities by remembering what made them great in the first place and kept their readers enthused. It certainly wasn't by slipping into ubiquity. The diminutive title of "sated" recedes to let the cookies take center stage. There is no visual clutter and the subheadings are kept to a bare minimum. 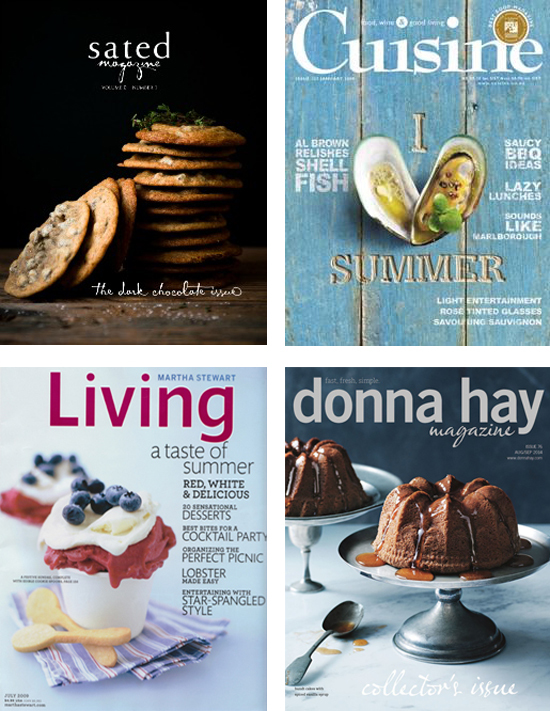 Cuisine did a beautiful job with this cover: a cooked oyster is arranged in a heart shape so that the central theme appears clearly centered: "I (heart) Summer." The words I and Summer are carved into the wood of a dock. It's creative, modern and pleasing to the eye. Martha's July 2009 issue is one of my favourites. The two ice-cream cups are nicely arranged on a napkin and a closer look reveals that the spoons are in fact tiny cookies: carefully considered details! Donna Hay rarely disappoints with her covers. They are classic and timeless but still modern, reminiscent of Dutch paintings but with a contemporary and minimalist twist. Oh my goodness - seeing this many covers all at once makes your point precisely. Can you just imagine having a casually small pile of magazines on a coffee table or whatever your design style allows and seeing all this mess? Having a cover that touches on a few of the included articles is wonderful. It keeps people from making magazines on display all dog-eared...who wants to pay good money for that, right? But being assaulted by sometimes garishly colored, sloppy looking food is disgusting. I refuse to buy these publications as well as those that have an extraordinary number of prescription drug ads that use up pages and pages. I really do LOVE magazines but the ones I even consider purchasing are dwindling. Let's hope that soon this trend will go away and we can look forward to some classier publications. Bravo, dear friend! You are right on target. 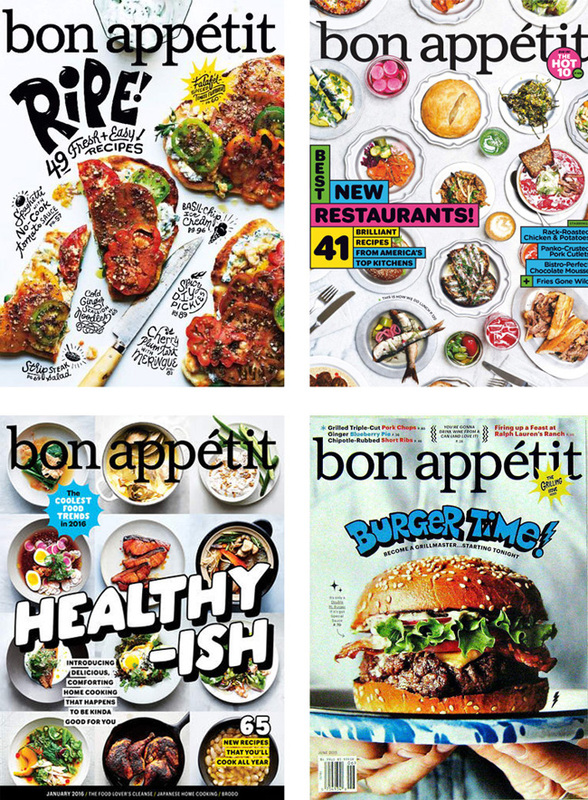 I did not renew my subscription to Bon Appetit, simply because the entire magazine (beginning with the cover) just became to comic-bookish. Compared to some of the others, the Living magazines are tolerable (to some degree) with the exception of the February 2015 cover. I will NEVER understand that choice.. I rarely see a Donna Hay magazine.. I instantly fell in love with the cover. It makes me want to explore what's inside. Here's hoping 2016 will start a 'clean cover' trend. Thank you, Kenn and Chris! Kenn, Donna Hay is an Australian magazine, so it's not always easy to find. It's a bit pricey, too, but it is beautiful - printed on high-quality paper with beautiful photography and very good recipes. I have a few issues to keep around for inspiration. You should seek it out if you can. Barnes & Noble likely carries it. I think these covers are a reflection of reality. The rise of bloggers and sites like Pinterest have shown that people are looking to "real people" for "real food" recipes. Advertising revenues has declined so dramatically that magazines are doing whatever they can to survive. Even Better Homes and Gardens has shrunk in size. If these covers sell, then it would be foolish for magazines to alter their approach.